According to news agencies, there was a major attack in central Karachi, killing at least 15 people and injuring 40 (though this number is quickly changing). The “massive explosion,” which was heard up to two kilometers away, reportedly targeted the DIG Criminal Investigation Department (CID) office in central Karachi, an extremely fortified area of the city. According to Express 24/7, the CID had arrested members of “banned outfits” on Wednesday, implying this may have been the reason for the attack. A police liaison committee spokesman told Al Jazeera English that this was “the biggest ever blast” in the city. According to Express’ correspondent, the casualty numbers are increasing due to the blasts but also because the bombing caused the collapse of a number of nearby houses (at least 15-20 houses, colony houses, and 2-3 commercial shops were destroyed). Numerous people are still trapped under the rubble in the aftermath of the attack, and ambulances are currently on the scene. 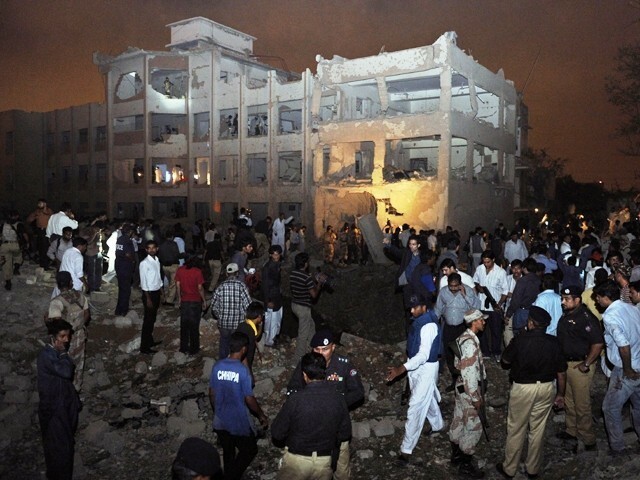 Although Karachi has been struck by recent politically-driven and ethnic violence, news correspondents say the blasts had nothing to do with this trend, and is more consistent with militant attacks in Pakistan, [Imran Khan compared it to the 2008 Marriott attack in Islamabad]. The question, noted the news agency, is how someone could get a device of that size in Karachi, and how they could so easily attack the CID office, which was housing “high-value” targets. There is the possibility of a second blast, noted Express. CHUP will continue to update this space with more details as they come in. UPDATE 1131 EST: According to Express, five armed gunmen began firing indiscriminately before “ramming their vehicle” into the CID building, causing the explosion. [Personal thought] Again, if the CID conducted arrests of high-profile militants yesterday, we have to think that the logistics that would go into such an attack in a highly fortified area would be pretty extensive, if it was indeed motivated by those arrests. Therefore, the attacks were either connected indirectly to the arrests and/or had been planned beforehand, OR the Taliban wasn’t directly responsible for the logistics, but it relied on groups like the Lashkar-e-Jhanghvi, etc. who have more extensive networks in urban areas, to carry it out. There were suspicions that the attack was a reprisal for a recent series of arrests of militants. Babar Khattak, a top police official, said that the police counterterrorism unit had arrested nine militants in the past few days. But there were conflicting reports about whether the suspects were in the compound at the time of the attack. Mr. Khattak said they were not, but Fayyaz Leghari, Karachi’s police chief, said that several militant suspects were there. as always the bombs never fail to shock me and fill me with unbelievable anger. But like you have rightfully said that the perpetrators can’t be identified under the blanket term at all. so where does one direct their anger? I have been listening to various live news broadcasts from Pakistan and I have heard something repeatedly which is disturbing (yet not surprising): The correspondents on Duniya News and Samaa News have mentioned that there are supposedly two police mobiles (pick-up trucks) missing along with an ASI (Asst. Sub-Inspector) who had recently been arrested. Since this area was supposed to be a highly secured “Red Zone”, but still the perpetrators got in so easily, dare we speculate that this was an inside job? I am not jumping to any conclusions because there is always false information disseminated after these incidents. However, I feel the Government better get their act together NOW and get a handle on things…I can already hear the boots being polished and tanks being readied in the barracks. Karachi needs a controlled deployment of paramilitary forces supported by the boys in green.